In flat corrections , Wave B terminates near the end of Wave A. In expanded flats, wave B of the 3-3-5 pattern terminates beyond the starting level of wave A. The big picture wave count based on the initial primary degree five wave rise from the Mt. Gox price data, is that BTCUSD is correcting in an expanding flat correction pattern. Wave ((B)) is entering its final couple subwaves to complete an ending diagonal pattern for wave (C) of ((B)). 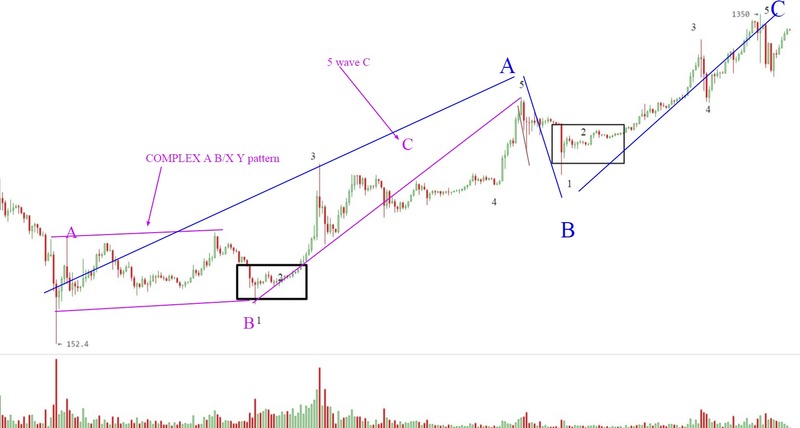 When the new all-time high is registered Bitcoin price will begin to unravel in a 5 wave impulse over several months to year(s) to complete the ((A))-((B))-((C)) pattern. The wave ((C)) low will mark the end of cycle degree wave II. However, three different trade volume analyses reveal that while Bitcoin price has trended up to new all-time highs, volume has diverged since the previous price and volume highs. This suggests that the latest rally is not the start of a new trend but the weakening of a counter trend rally. People are getting excited – about new highs, Bitcoin has surpassed gold (price) and silver (market cap), and Bitcoin’s outperformance of the stock market when the stock indexes have also reached new all-time highs – it’s more likely time to take profits not buy in. 交易开始: Minimum price target for all-time high has been met. A potential complete pattern is in place although I expect further highs to be made. I do not try to time markets. I have been dollar cost average purchasing BTCUSD. I am selling and taking profits and will look for high probability opportunities to take short positions. 评论: I under estimated how high wave 5 could go but, I did call for the throw-over which supports that this pattern may still be valid. You said you could not count a 5 wave from the 'bottom' (?) at $162 back in 2015. But what do you make of this count ? @Afrikoin, you present a legitimate count imo. When a few of the exchanges are combined (following the coindesk index for example) to smooth out the spikes on the charts the waves do not overlap as much providing a more accurate count I believe. Unfortunately, the combined data does not go very far back so I stick with Bitstamp mostly for the charting which could be a mistake on my end. I still argue for my case for a couple reasons. 1) Without averaging out data across exchanges my primary count does fit. 2) My analysis is based on a (log and arithmetic scale) 5 wave rise beginning during the Mt. Gox time period. The decline to the 2015 low (about a year and 1 month decline) relative to the 5 year rise is on the short side in terms of duration. 3.) Likewise, wave ((ii)) is disproportionately long relative to wave ((i)) and the same can be said about wave ((iii)) relative to wave ((i)). 4) Volume analysis above does not support that this is the beginning of a bull trend. Wave (iii) and ((iii)) circle have declining volume on a blend of exchanges, which does not support the bullish count. In fact, the March 2017 uptrend in volume was on selling volume. 5.) Despite the ongoing hard fork debate with Bitcoin and Bitcoin Unlimited sentiment to own bitcoin, particularly with prices hitting new highs, imo seems to be positive (I would prefer to support this with a quantitative measures but I don't have them. Scrolling through Twitter, Tradingview, mainstream news articles, reddit, and even Facebook, you can get a qualitative idea of sentiment). With that said, I don't rule out your chart but, looking at the highest probabilities I continue to stand behind my primary count. I do appreciate you sharing your chart. It really helps to see others ideas so we can see what may have been overlooked or didn't notice at all. You should publish some charts, I'd like to follow. I think we also learn to be more objective when we subject ourselves to the humility of being wrong. @Kappy, thanks for your response! @Afrikoin, oh lol, could link me to the exact tweet? I'm interested in replying to him to see if/what he would respond to my questions regarding volume and wave structure. @Kappy, I have also been wave counting, and this rise caught me off guard, especially after breakdwon from $1350 to $891. Now, i am looking at ending diagonal, expanding diagonal or a 5th wave of an extended 3rd wave. TBH, I have come across a lot of EW chartists that got caught off guard too. I wonder why? I am also with you on the rise up from $162. It doesnt look like a pure 1 - 2 -3 - 4 - 5 wave pattern (impulsive), but i have now seen 2 EW counts that count is as such. One of them was the one i share above. The other i will share here then perhaps you can share your opinion. @Afrikoin, here are two more charts worth considering. This one is dated, it has payed out accurately.